Educators engaged in making at the 2nd Annual Maker Educator Convening in 2016. In response to the need to connect maker educators with one another and with the experiences of colleagues in their field, Maker Ed contracted with SRI International (SRI) in early 2016 to conduct research aimed at better understanding educators engaged in maker-centered learning communities, and to provide insight into promising approaches for professional learning. This work aims to support the development of robust supports for both formal and informal educators working in maker-centered learning environments. 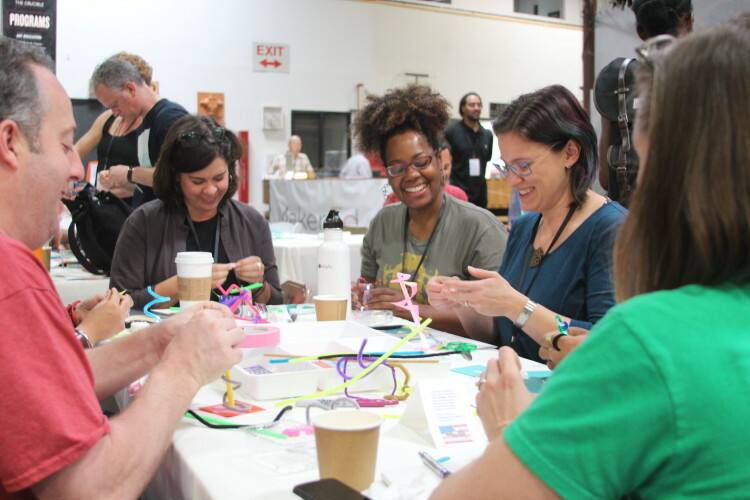 “A Study of the Communities and Resources that Connect Educators Engaged in Making” investigates maker-centered learning communities for educators, and documents the needs of maker educators in terms of access to shared resources and connections with peers. Toward this end, this study includes analysis of interviews with leaders (N=16) and participants (N=17) of teacher-centered and maker-centered communities and survey responses (N=492) from maker educators. The goals of the study were to: 1) identify both short- and long-term needs of maker educators in terms of access to resources and connections with peers, 2) determine the reasons for joining online and blended maker-centered communities, and 3) highlight common ways educators participate in these communities. Explore Making and Maker Educators in the U.S. This interactive map shows the group of U.S. based individuals who responded to the survey. The map can be sorted in two ways, either by respondent’s work environment (school, library, museum, etc.) or setting (urban, rural, suburban). Click on the button in the top left of the map to open a sidebar and sort the data. Data points can be clicked to reveal more information about the respondent, including information about how they’ve incorporated making into their practice. The report titled “A Study of the Communities and Resources that Connect Educators Engaged in Making,” published September 2016, was produced by SRI International for Maker Ed. SRI makes no representations or endorsements with respect to the use of any excerpt of the full report.